Posted on Tue, Jan 24, 2012 : 7:50 a.m. Looking for a gentle giant of a dog to call your very own? If so, you must come and meet Hagrid, a 3-year-old purebred Saint Bernard who is available for adoption at the Humane Society of Huron Valley. When it comes to a laid back personality you won't find a more calm dog than Hagrid. Sadly this big guy’s family could not care for him and he came to the shelter to find a home where his needs can be met. It's important to remember that big dogs like Hagrid eat a good amount of food, will need space to stretch out, and will need proper grooming to keep his coat soft and tangle-free. 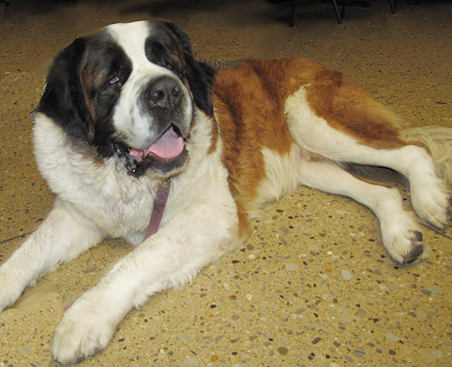 Saint Bernards do need exercise, and Hagrid loves to go for walks with his family. He also craves companionship and needs quality time with his people. Because of Hagrid's size, Hagrid could accidentally knock over small children, so we are looking for a family with kids over 12 years age for his adoption. We also understand that Hagrid is not a big fan of cats, so a cat-free home is must for Hagdrid as well. If you have room in your heart and home for a big, loving dog, please come in and visit with Hagrid. He is ready for adoption now. Please find out more about this amazing breed and see if Hagrid might be a good fit for your family. There are many misconceptions about shelter dogs, including that there are no purebred dogs available in animal shelters. The fact is, your chances of finding a wonderful companion who matches your lifestyle and family are excellent at HSHV! About 25 percent of the dogs that come in our shelter are purebred. The others are one-of-a-kind mixed breeds, many of whom have already lived with families and have the basic social skills they need to become an enjoyable part of your household. The programs that HSHV have, including our "Head Start" program, help dogs start or continue their training as soon as they arrive, and our adoption counselors are knowledgeable and friendly and can guide you to a pet that will be the best fit for your situation and home.